Adding Service Times are an important step in getting started using Church Metrics. Once you have your service times created, you will be able to enter data into Church Metrics that you can then view in reports and on the Dashboard. 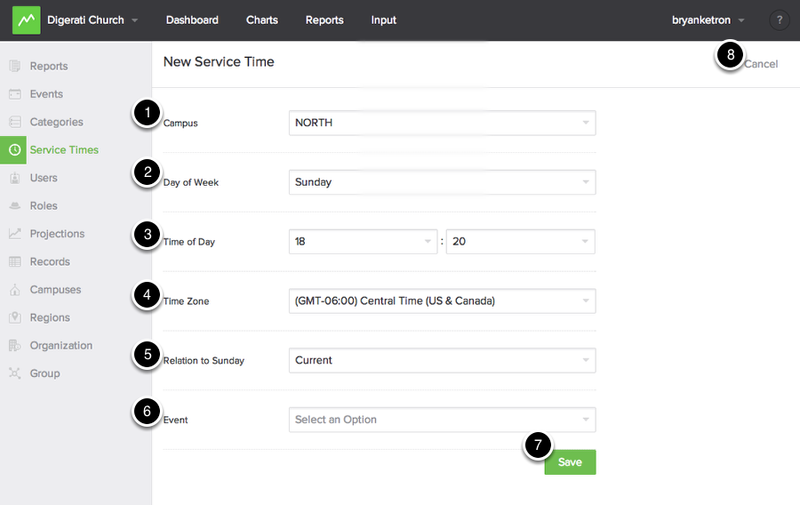 From the Admin Navigation, select "Service Times"
5. Relation to Sunday: this tells Church Metrics where the data needs to be recorded in relation to Sunday. If you have Wednesday night service and you want it to be recorded with the weekend that is about to happen you will want to mark it as "Before". If you are wanting your Wednesday night service to be recorded with the week that just passed you would want to mark it as "After"
6. Event: If you want only want the service time associated with a specific Event you can select it here. For more information on Events please visit our "Creating an Event" documentation. Be sure to save your event! If you need cancel your service time, you can select "Cancel". If you would like to edit or delete your service time at any point, you can go back into the "Service Times" tab and update them.